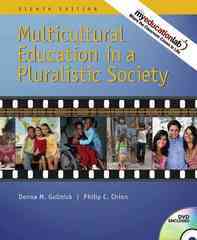 Multicultural Education in a Pluralistic Society 8 Edition This respected text for courses in Multicultural or Multiethnic Education provides students the tools necessary to teach effectively in today’s diverse classrooms. “Pluralistic” is defined as having multiple aspects or parts. The classroom of today has students from multiple backgrounds, cultures, and races. Within those differing groups students have their own individual differences. Their home situations may be very different. They may be from a different social class. Each teacher also comes to the classroom with their own cultural background and past experiences that will effect how they will handle different situations. The goal of this book is to help students to apply what they have learned and in turn to prepare their students to live in our heterogeneous culture. Eight micro-cultures that teachers may encounter in the classroom are examined in detail: They are: · Ethnicity and race · Class and socioeconomic status · Gender and sexual orientation · Exceptionality · Language · Religion · Geography · Age Some of the features of the book are the ABC News Video Insights boxes that explore current issues in multicultural education today, Focus Your Cultural Lens Debates that ask the reader to take a position on controversial school issues with for and against statements to consider, and the Pause to Reflect feature which lists questions and activities to promote self-awareness and ownership of past experiences and how they may affect a teacher in the classroom. The Critical Incidents feature gives both real and hypothetical situations that occur in schools and encourage the reader to examine their feelings about them.